It used to always kill me to buy a bunch of radishes and discard the leafy tops. I have never had the space to compost, so all of that plant matter would go straight into the trash. It killed me every time until I found out that you can eat those radish greens and they are delicious. Yes, you can eat them! Raw, they have a nice, spicy bite. Cooked, their flavor mellows and they taste warm and wonderful. Like the best tasting, silkiest spinach ever. To think that I was throwing them away for all those years! They are a bit of a pain to clean since you have to fastidiously wash all the dirt and grit from the leaves and stems. It is worth it though. When I saw wild spinach (also known as lambsquarter) at the Greenmarket, I immediately thought that spanakopita would be a great way to use both greens. When I think about Greek food, I think about the Greek landscape: scrubby in parts, dotted with wild herbs and craggy olive trees. There is something a little rustic about the combination of wild spinach and radish greens that fits my little Mediterranean fantasy (never mind the fact that there is nothing rustic about the Greeks; they are as polished and well-turned out as the Milanese). Spanakopita is wonderful mix of greens and feta wrapped up in flaky phyllo dough. You can make these little triangles, or alternately layer the phyllo dough sheets and the filling in a ceramic dish to bake as a giant pie. Some might be disappointed to see that I didn’t make my own phyllo. Does anyone really make their own phyllo anymore? I think the oft-repeated saying goes that a woman is good Greek marriage material when she can roll phyllo thin enough for her prospective husband to be able to read a newspaper through it. I don’t plan on being anyone’s Hellenic housewife any time soon, so store-bought phyllo dough it is! 1. In a large pot, heat some olive oil over medium heat. When the oil becomes fragrant, add the wild spinach to the pot along with a few tablespoons of water. Sauté the spinach until it is just wilted. Remove the wilted spinach with tongs to a colander to drain. Repeat this process with the radish greens. 2. When the greens are cool enough to handle, use your hands to gently squeeze and press as much liquid as possible out of the leaves. You will be amazed how much liquid there is. Try to be thorough; the less moisture there is in the leaves, the better your filling will be. 3. Finely chop the greens and put them in a large bowl. To the bowl, add the feta and the nutmeg. Stir everything together until the cheese is evenly distributed throughout the greens. Adjust the seasoning before adding the beaten egg. 3. Preheat the oven to 375°. 4. Fold the phyllo sheets in half lengthwise and cut them in half. Fold each half lengthwise and cut them in half again. Each phyllo dough sheet will give you 4 long strips of dough. Cover the strips snugly in plastic wrap. Working one strip at a time, make the spanakopita. Gently brush each strip with melted butter. Starting at one end, put a dollop (about a scant tablespoon) of filling in the upper corner. Fold the phyllo dough down over the filling to make a triangle. Now fold the filled triangle up. Continue to fold the strip into triangles, like folding an flag (or at least how we Americans fold a flag). Don’t worry if the folds aren’t perfect. Working with phyllo can be very forgiving because you can always make the uneven edges stick to main triangle with more butter. 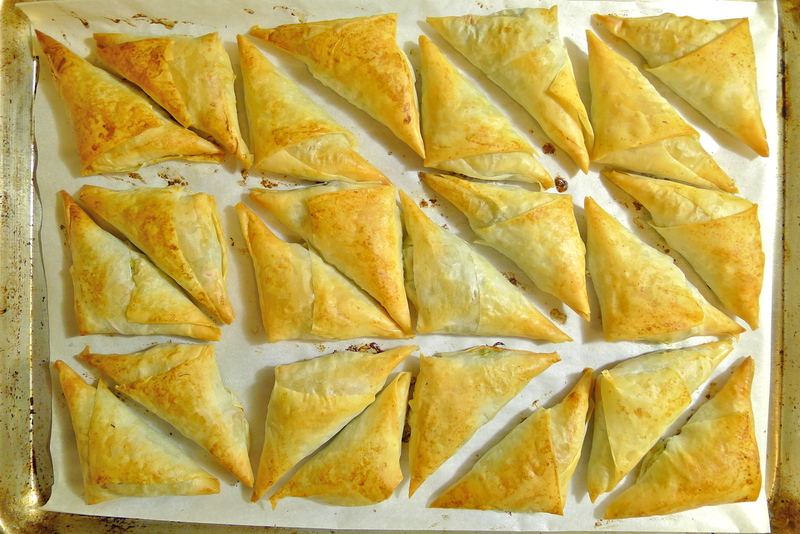 If you want crunchier spanakopita, you can layer two strips of phyllo dough together with brushed butter and then fold the triangles up as you would with one strip. Just remember that you will need double the number of phyllo dough sheets in this case. Continue folding with the remaining strips of phyllo dough. Arrange the completed triangles in a single layer on a parchment paper-lined baking sheet. You should end up with 24 filled triangles total. 5. Brush the triangles with the remaining melted butter. Bake them for 20-25 minutes until they are golden and crisp. Serve hot. I had planned on adding about 1/4 cup of fresh dill, a 1/4 of a cup of fresh parsley and a 1/4 of a cup of freshly chopped green onions, but I got distracted by a terrible werewolf movie on television called Blood and Chocolate. I think lost brain cells! It wasn’t even corny, or cheesy or cool in a bad cult-movie kind of way. It was just bad. Looks and, I imagine, tastes fantastic. Interesting about the radish greens. They were great! I was so surprised about the radish greens too. I thought the leaves would be too bitter or too weird. Imagine my surprise when I tried them for the first time and found them delicious! You can eat carrot tops too. I’ve only thrown them chopped into salad, but I am thinking about trying to cook them now . . .
Great pictures. I will be using my radish greens from now on. Great tip! Thanks, Chef Connie! I never let my radish greens go to waste now. They’re great. You can reheat them easily by popping them in the oven for a little bit. Mine are all gone because I ate them too fast! Regardless of whether radishes are for you, finding out you can eat radish tops kind of opened me up to all kinds of other tops that I used to just chuck in the trash: carrot tops, turnip tops, beet root tops! I have to experiment with carrot tops. I find them good, but can only take a little bit of them in a salad (they can be so carrot-y! and chlorophyll- y). Any ideas? But beet and turnip greens? Oh yeah! I wonder if carrot tops would make good pesto….? I saw a lot of carrot pesto recipes online. Looks like it would! Also did some more reading on carrot top toxicity. Looks like they’re fine. No worse than parsley! Hmmm. Just read that carrot tops are poisonous. But technically so are potatoes, green tomatoes, apple seeds and cassava. I wonder if cooking neutralizes it carrot top toxicity . . . I mean, there are a lot of recipes out there, right? Awesome idea Daisy. I LOVE spanakopita. I always have them made and frozen in the freezer and take them out and bake them a little at a time when the craving hits me. I even made some in my food and culture class the other day. They have to wait now for a while until my 13 more pounds come off! sigh! Oh, that is a great idea! I would love to raid your freezer. I bet it full of all kinds of tasty things like spanakopita and samosas. Congratulations on the weight loss so far! I bet it feels good to make progress! Well, if it is proportional to the pain I should already be a size 0 by now but alas it’s a bit slow going. But if I was a size 0 my head would look really large. No, you don’t want that. I was a 0 in college. About a year ago, my college roommate gave me some photos that she found of me back when we were living together. You know those aliens on the X-Files? The ones that just have giant heads? That was me. I looked like a Q-Tip with eyes! No danger of that happening. EVER. I love how you were inspired by imagining the scrubby Greek landscape. 🙂 I really like radish greens–I just toss them in with whatever I’m making. Or when they really pile up I make Radish Top Soup (which I will probably post soon because radish season is well underway here!). These look deee-licious. I was thinking about making a radish top soup too! You can basically substitute them for almost any recipe with spinach. Very tasty. I hate waste, and it was such a revelation to know you can eat them. They look delightful! Absolutely perfect. I’ve been wanting to make spanakopita for age – perhaps this’ll give me kick up the arse I need :D. Lovely stuff. Thanks, Frugal! Spanakopita is a lot of fun to make. I don’t make them very often, so I am kind of slow at folding them up. I have all this leftover phyllo, so maybe I will make the pie version. It’s quicker! I bet it is! The pie version sounds like a great idea too! Chickens must be fun to have! Do you have more than one kind? Chard and spinach is overrunning the market over here too. Love the leafy greens! Currently we have mostly Buff Orpingtons, but there are some Aracaunas, R.I. Reds and Silver Wyandottes in the mix. They are fun—especially for me, since Steve handles most of the chicken chores! sounds interesting! thanks for all the good information you share with us. I had no idea that you could eat radish tops until recently but it does make sense that they would be good. Your spanakopita sound great. Thanks, Karen! I was happy to find out that you could eat radish tops too. I hated throwing them out. It seemed like such a waste. “Best tasting, silkiest spinach ever” sound great! I didn’t know you could eat the tops either. I guess this would be a great reason to try and grow radishes. I often find the radishes in shops to be less than firm so have avoided buying them for a long time. Squishy radishes sound pretty unappealing, especially given that the bulk of their appeal is their crunch! I hear that radishes are ridiculously easy and don’t require much soil depth for a root. If you do grow them, I bet they will be amazing! Thanks, Malou! Once I found out how delicious radish tops are, they became my favorite part of the radish! I am so in to radish greens lately! I had no idea they were so delicious! This looks absolutely incredible! I adore this idea of camping out in a blog! It is really cool. I can’t wait to do some camping of my own as soon as this dissertation is over. That sounds like so much fun! Thank you for the idea and for the visit. You are always welcome here!